July 4, 2013 - Joseph Alioto of Alioto Law Firm in San Francisco, has filed an antitrust lawsuit on behalf of 40 customers in federal court to block the merger between American Airlines and US Airways which had been announced in February 2013. The suit contends that the merger between the two carriers would further erode competition, hurt consumers and put 90 percent of the domestic air travel business in the hands of four companies, Delta, Southwest, United and American Airlines. In November 2011, American Airlines filed for Chapter 11 bankruptcy protection and in May 2013, the bankruptcy court approved the merger with US Airways. The two airlines announced the plans for American Airlines to merge with US Airways through a stock swap the airlines valued at $11 billion, with the carriers keeping the name American Airlines. The announcement of the merger follows the acquisition of Northwest Airlines (Northwest) by Delta Air Lines (Delta) in 2008, the merger of United Airlines (United) and Continental Airlines (Continental) in 2010, and Southwest Airlines’ (Southwest) acquisition of Air Tran Airways (AirTran), in 2011. If the Department of Justice approves the merger, American and the US Airways merger would surpass United Airlines in terms of number of employees, seat capacity, and operating revenues to which the merger would create American Airlines as the largest passenger airline in the United States. Ed Stewart a spokesperson with US Airways said "as is often the case with high profile mergers, lawsuits containing baseless allegations such as these are filed and they are successfully defended." Texas Attorney General Greg Abbott and 19 other state attorney generals have joined with the Department of Justice to review the proposed merger between American Airlines and US Airways, as states typically do so in order to look out for their own states interests. If this merger is allowed to go through, without a doubt there will be pros and cons that will impact the consumer. 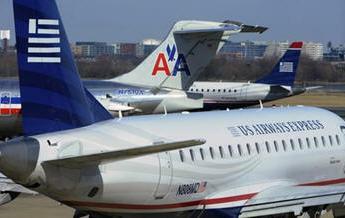 Congress has raised concern that if this merger goes through American and US Airways combined would have over 70 percent of the takeoff and landing slots at Reagan National Airport an airport south of downtown Washington, D.C. Some have suggested that if the sale is allowed to go through, the carriers should be forced to sell off some of their slots in order that consumers will have choices and there will be completion at the airport. In the early years of the 1978 deregulation of the airline industry, it brought about a number of startup air carriers, resulting in competition which helped to reduce ticket prices and improved carrier expansion in service especially to smaller communities. However, that was short lived. By the mid 80’s competition in the airline industry began to erode as venture capitalist like Frank Lorenzo began swallow up competition through mergers (Continental Airlines, Eastern Air Lines, Frontier Airlines, New York Air, Peoplexpress Airlines) resulting in higher ticket prices and reduced services. A flurry of mergers and acquisitions occurred during the 1980s, when Delta and Western Airlines merged, United acquired Pan Am’s Pacific routes, Northwest acquired Republic Airlines, and American and Air California merged. Since 2000, American acquired the bankrupt airline TWA in 2001, America West acquired US Airways in 2005, while the latter was in bankruptcy; Delta acquired Northwest in 2008; United acquired Continental in 2010; and Southwest acquired AirTran in 2011. Other attempts at merging since 2000 failed because of opposition from the Department of Justice (DOJ) or employees and creditors. For example, in 2000, an agreement was reached that allowed Northwest to acquire a 50 percent stake in Continental (with limited voting power) to resolve the antitrust suit brought by DOJ against Northwest’s proposed acquisition of a controlling interest in Continental. A proposed merger of United and US Airways in 2000 also resulted in opposition from DOJ, which found that in its view, the merger would violate antitrust laws by reducing competition, increasing air fares, and harming consumers on airline routes throughout the United States. Although DOJ expressed its intent to sue to block the transaction, the parties abandoned the transaction before a suit was filed. In 2006, the proposed merger of US Airways and Delta fell apart because of opposition from Delta’s pilots and some of its creditors, as well as its senior management. Since deregulation in 1978, the financial stability of the airline industry has become a considerable concern for the federal government due, in part, to the level of financial assistance it has provided to the industry through assuming terminated pension plans and other forms of assistance. From 1979 through 2012, there have been at least 194 airline bankruptcies, according to Airlines for America (A4A), an airline trade group. While most of these bankruptcies affected small airlines that were eventually liquidated, 4 of the more recent bankruptcies prior to American’s (Delta, Northwest, United, and US Airways) are among the largest corporate bankruptcies ever, excluding financial services firms.